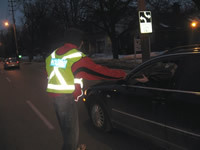 As part of our commitment to MADD Canada’s goals, MADD London Chapter members and volunteers are active in the community to heighten awareness about the dangers of impaired driving. One such initiative is our road side signage project. We are in the process of creating Campaign 911 roadsigns that will be located at various entry points into the city. 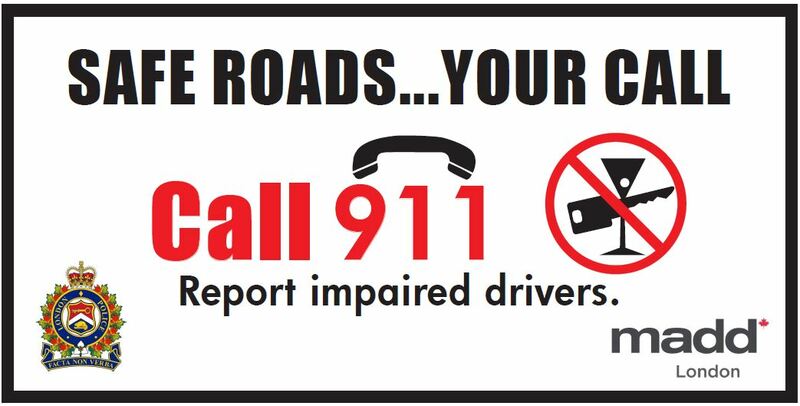 These impressive 4 x 8 signs encourage drivers to call 911 if they suspect an impaired driver. This year we have funding to erect five new signs and we will be continuing this project over the next few years. 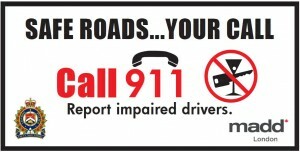 Our goal is to have a Campaign 911 sign located on all roads coming in to the City of London. Now, more than ever, it is critical that we convey this message to our neighbours as every day, on average, 4 Canadians are killed and almost 175 more are injured in alcohol and drug related crashes. The R.I.D.E. Program (Reduce Impaired Driving Everywhere) originated in 1977 in Etobicoke, Ontario, as a community policing effort to address public concern about drinking and driving. Now, over 30 years later, the campaign continues to be an important tool for police nationwide. Although these programs run year-round, they are highlighted during the holidays to encourage sober driving. These spot checks are an important part of our commitment to keep our roads safe. These are the details for the London 2012/2013 Festive R.I.D.E. program sponsored by the London Police Department. We thank the London Police Department for their tireless work in the fight against impaired driving. The School Assembly Program reaches over a million students across the country. Do you need a victim speaker? Are you a student doing a project? 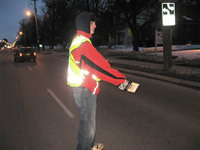 Do you need someone to come speak to your group about the dangers of impaired driving? We have several excellent videos and visual aids that can help our knowledgeable volunteers show your people the effects of impairment. We can also offer handouts for presentations. Invite MADD London to your event.